During a workshop organized by the National Council of Telecommunications (CONATEL), at the Celebration of World Day of Telecommunications and Information Society which was held yesterday, Jean Jonasse Elysée the Director of CONATEL declared "We have all the services available in Haiti, although they are not evenly distributed across the country [...] The telecommunications in Haiti have grown with the introduction of mobile phones on the Haitian market [...] There are now 35 phones per hundred people, before the advent of cell phones, we had less than one telephone per inhabitant. We now have access to telephone service on 90% of the country." 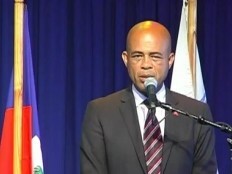 The President Michel Martelly who was present at the celebration declared : "There are ways to create jobs by using information and communications technology (ICT), this is new [...] and too few Haitians are imbued. It is imperative to force the note, so I'm here to support you this is as simple as that [...] I'm no expert, but I use a lot of technology and it plays an important role. It is absolutely essential to put Haiti in the global era, and that's why I'm here today to tell you that I support you, I am ready to accompany you in your efforts to make good use of ICT." Returning on the project of President Martelly to create a special tax on call minutes to help fund education in Haiti, the Director of CONATEL wanted provide some clarification "These are not the local minutes that we will increase, we will not touch to these latter, we will add 5 cents on each minutes of the incoming calls. This money will go into a fund that will serve to increase the capacity of our schools to accommodate more children." The Director of CONATEL took the opportunity of this day to announce that the company Natcom (former Teleco), will deploy a fiber optic network, which will allow access to more applications (education, health etc ...) throughout the entire national territory.